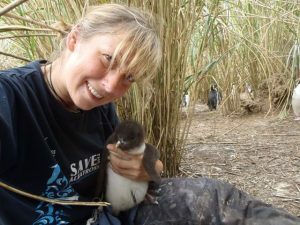 I am a penguinologist, and I work for the RSPB Centre for Conservation Science in Cambridge. 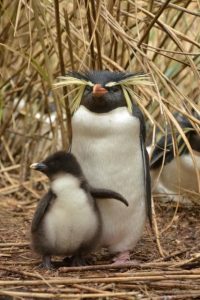 At the moment I am doing research on the northern rockhopper penguin, the only endangered penguin species in the UK territories. I have been able to travel from the equator to the pole, to some of the remotest places on Earth. My research focuses on understanding the processes that regulate seabird distributions, demography [changes in the numbers of births, deaths etc] and population dynamics, and applying this understanding to the conservation of threatened populations. Hanging in near-vertical cliffs, sleeping on lava, stomping through thigh-deep snow, spending hours baking under the sun, waiting in rain and storms, and sometimes risking life and limb, I do hope I am able to make a difference, raise awareness and help safeguard these lovely birds. The Tristan da Cunha archipelago is very remote and just to get there it’s quite a task: from Cape Town [in South Africa] you have to get on a vessel and after seven days at sea they drop you off on the island, if weather permits, by helicopter, otherwise via a little dinghy. There are no human inhabitants on Nightingale Island, where I am working, so I have to do three months of food shopping prior to the field season and have everything dropped off by the helicopter upon arrival. While on the island, life is very basic. There is no freshwater other than rainwater, so water is more valued than gold dust. The fieldwork can be very hard: the island is mainly covered in very dense vegetation of tussock, a two-metre high grass. Now, if you are a penguin and standing about 40cm tall, this is okay as you can get through it. But, if you are a human, you need to crawl on all fours. Sore knees are a sign of the job! But then, out there, on my island, that’s when I am most alive, at my best. As a field biologist, observation and communication skills are important. You also need to be able to adapt to very basic life and be resourceful: you are likely to stay for months in a very remote place with little comfort, so you need to be prepared for that. A degree in biology or natural science should provide you with sound knowledge and a base from where you can launch in different directions. 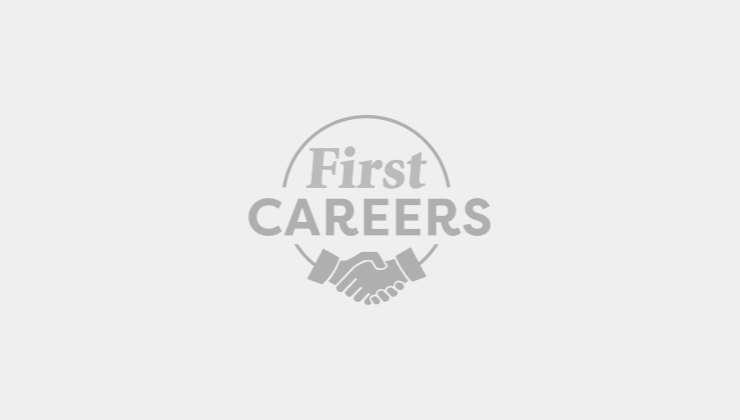 Get some fieldwork experience and find your passion and pursue it. For me it was penguins, and I never looked back!